Like Three-Fingered Brown after him, Hugh "One-Arm" Daily was saddled with a sobriquet more fanciful than factual. For, as sure as Mordecai Peter Brown had digits enough to count to four on his right hand, so Hugh Ignatius Daily was possessed of a full complement of brachial appendages: the left one, owing to an accident in youth, merely lacked a hand at the end. In a fleeting and far-flung career— six seasons, seven teams, three leagues—and with the hindrance of his handicap, he achieved some remarkable feats. Coming off a 23-win 1883 season for Cleveland in which he threw a no-hitter, Daily could not have been blamed for succumbing to a bit of hubris when it came to signing a contract for ’84. Unsatisfied with his Cleveland salary, he grabbed a better offer from the new Chicago Browns entry in the Union Association. Daily was uneven in the season’s early going, but found his groove with consecutive one-hitters against Washington in May, and by mid-June the Browns were wrestling Baltimore for second place and Hugh was 14–8. But things went rapidly downhill from there. Chicago tumbled into an 11-game losing streak, Daily taking the loss in seven of them and suffering the further indignity of being pulled from the box in two of his starts. Having fallen to fifth place, the Browns traveled to Boston to meet the third-place Reds, who were enjoying a cozy 23-game homestand at their Dartmouth Street ballpark. The “one-armed” ace would hurl in the July 7 series opener. Though a somewhat ragtag bunch (like most UA squads) the Reds were not pushovers by any means: They would finish third in wins, third in total bases, and fourth in runs scored. At their helm was first baseman-manager Tim Murnane. A veteran of the National Association era, he brought much-needed experience to a team on which most of his starters were 10 or more years younger than he. 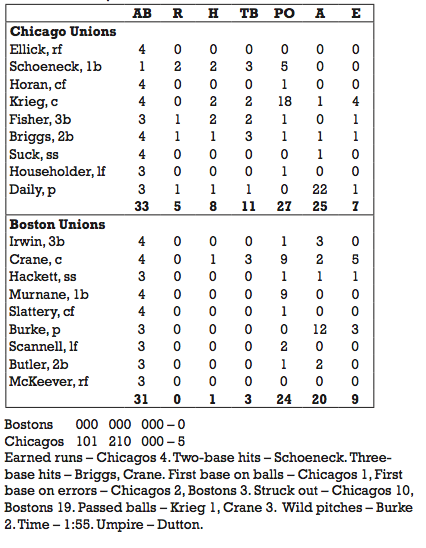 It’s possible that some of the 1,000 patrons present at Dartmouth Street on July 7 had been in attendance at the other Beantown park, the South End Grounds, exactly a month earlier, when Providence’s Charlie Sweeney fanned 19 Boston batters in a National League contest. If so, they would have the privilege of seeing another pitching masterpiece on this day. Third baseman John Irwin led the game off for Boston. 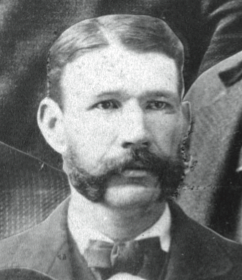 His brother Arthur Irwin, shortstop for the pennant-bound Grays of the National League, had a more accomplished career, but John did manage to loiter in the big leagues through 1891. He quickly became Daily’s first strikeout victim. Catcher Ed Crane was up next. Crane would earn the nickname “Cannonball” while carving out a decent pitching career, twirling in more than 200 games, but as a rookie in 1884 he split his time mostly between outfield and backstop and was the heaviest hitter in the lineup. He too went down on strikes. To the plate now came shortstop Walter Hackett—a local boy, born in Cambridge, like brother Mert Hackett of the NL Bostons. He made the third notch on Daily’s belt. Hugh registered one strikeout in the second inning, and fanned the side again in the third. Meanwhile, the Browns got a run in the first, then took a 2–0 lead when Daily himself singled and scored in the third. Irwin and Crane brought the top of the Boston order around in the fourth and both whiffed again. Hackett became the first Reds runner, awarded first base when umpire Pat Dutton called a foul pitch on Daily. Apparently, his delivery was an issue all day; the Boston Globe claimed he “used the drop continuously, and every time he did so he delivered the ball from above the shoulder and violated the rule.”1 Murnane then reached safely on an error by Charlie Briggs at second. With a rally in the making, center fielder Mike Slattery stepped to the plate. Only 17, he would go back to the minors for seasoning for the next three years before returning to big-league play with the National League Giants in 1888. Here, facing the “wonderful one-armed pitcher,”2 the 6-foot-2 lad made the third strikeout of the frame. The Browns went up 4–0 as Charlie Fisher, playing in the last game of his short (11-game) career, singled, and Briggs tripled him home and scored on a putout. Showing no signs of letting up, Daily proceeded to erase opposing pitcher James Burke, left fielder Pat Scanlon, and second baseman Frank Butler—all on strikeouts, giving him 13 in five innings. In Chicago’s half of the fifth, Jumbo Schoeneck doubled and scored on another single by Fisher. The Browns now led 5–0, and thus ended the day’s scoring. Burke settled down and retired nine of the final ten batters. With two outs in the sixth, Crane cracked a three-bagger for the sole Boston hit. Daily issued no walks. When Slattery made the last out in the ninth, Daily’s strikeout tally was 19, equaling Sweeney’s month-old record. 1. Boston Globe, July 8, 1884, p. 5. 2. Boston Daily Advertiser, July 8, 1884, p. 8. 3. Boston Globe, July 8, 1884, p. 5. 4. Boston Daily Advertiser, July 8, 1884, p. 8. 5. Boston Globe, July 8, 1884, p. 5; Vaccaro, Frank. “Hugh Daily,” in SABR Bio Project, http://sabr.org/bioproj/person/8d8c99e4.